As the general election approaches, the clearly confused policies of the SNP need to be highlighted. Nicola Sturgeon thinks that another destabilising referendum to break up the UK, to be held only in Scotland, is quite reasonable (despite groans from the leaders’ debate studio audience). However, in a referendum on UK membership of the EU, she says that all four of the individual nations of the UK should have to vote to leave for it to happen. By that logic, any future referendum on Scotland’s independence should be decided by all the UK nations and not just Scotland, although we already know Scotland’s opinion, as it has been expressed very clearly. According to the SNP, the lifetime cost of our nuclear deterrent is too much at £100 million. By comparison, the expenditure the SNP proposes of £180 billion over the next five years to end austerity is, apparently, only a small amount. Teenagers of 16 and over are old enough to decide who should run the Scottish administration, but are so young that they need a “named person” to decide what is best for them until they are 18. Where is the logic? Nationalists want more immigration to Scotland, but Jim Fairlie thinks that immigration from the rest of the UK should not be allowed because it is unionist. Equally, excluding 800,000 Scots from the referendum vote was fair to them. These contradictions must be highlighted and the SNP shamed over its controlling, inward-looking, retrograde policies. 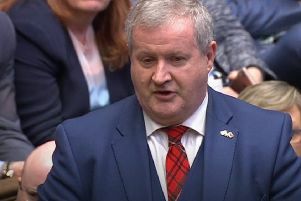 Nicola Sturgeon makes much of her claim that in the event of an in or out referendum on the EU all countries in the UK should be unanimous regarding a vote to leave. Clearly she would apply the same logic to another Scottish independence referendum, should there ever be one. In that event it is worth noting that out of the 32 regions in the referendum 28 voted No. At Tuesday’s STV debate, Nicola Sturgeon informed us that she is going to decide who will be the next Prime Minister. Contrary to recent evidence, apparently her first choice isn’t going to be David Cameron. Instead she has decided to anoint Ed Miliband. Call me old-fashioned, but in a democracy don’t the people decide who they elect to govern them? At last, at long last, Jim Murphy has got off the back foot and in the Scottish TV debate made a case for the retention of Trident. Not just for the thousands of jobs involved on the Clyde, that is merely a bonus, but for the fact that all our children and grandchildren will be infinitely safer protected by these necessarily horrible weapons. In a future world with inherently unstable countries such as Iran and North Korea in possession of nuclear weapons and the means to deliver them, and other already nuclear-armed nations with strong extremist elements not far from the levers of power, it would be insanity to give up unilaterally the only sure way of defending ourselves – by letting any aggressor know that an attack on the UK would mean instant and guaranteed oblivion for the attacker. Of course nuclear weapons must go. All of them. But that is a long-term project and must involving every country holding them and have absolute guarantees. Let the SNP and the far left posture and fantasise as much as they wish on defence and much else. They are good at that. Pandering to these elements is in the end destructive and will lose Labour many more votes than they will gain. Who selects the audience members for election debates? Are questions from audience members sorted out before the live broadcast? Are there criteria in selecting the audience? Who decides the criteria? While one would expect a fairly representative reflection of the general population in members of studio audiences, is this ever the impression that emerges? What allegiances do TV channels owe to what interests? Who owns the newspaper you might read? All right and proper questions, because perhaps the answers have much to do with what we read, what we hear, and what we see in the media and its various manifestations.